Are you sick of pumpkin recipes yet? Apparently I'm not. Right now my friend Jacob must be thinking, "Where's the chocolate?" I had actually planned a couple of savory, non-pumpkin recipes for this week, but then I wanted to bring a sweet to round out the pizza at an event for journalists I helped organize. So I went with the seasonal favorite, pumpkin. 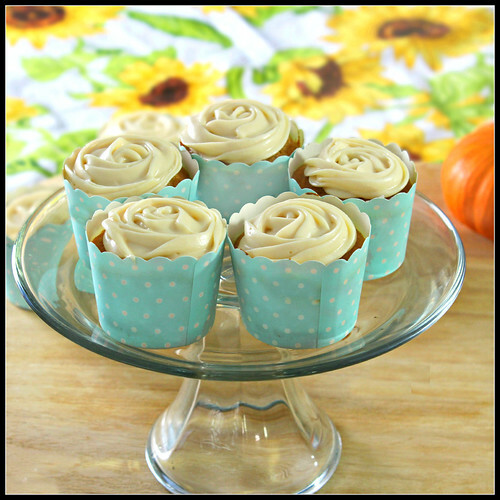 And who can say no to caramel cream cheese frosting? The cupcakes were a big hit, and people asked permission to take home the last few. Granted, of course. 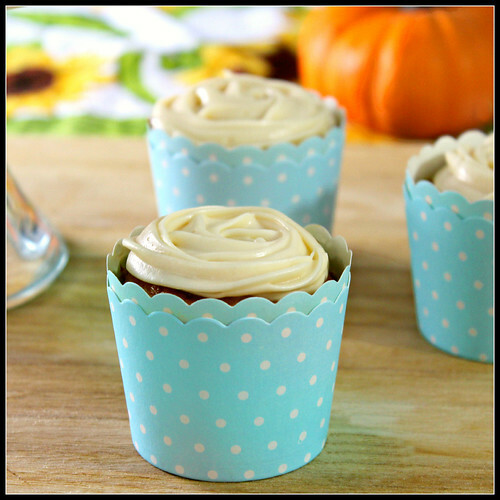 This recipe from Tracey's Culinary Adventures produces a light and moist cupcake, slightly sweet and nicely spiced. I thought it needed very little frosting, less than you see here. The caramel flavor doesn't really come across in the frosting, so I would skip making the caramel and just go with a plain cream cheese frosting recipe. Now, what should I make with the other half a can of pumpkin? Reminder: I have a new Facebook page. Please visit and "Like" it! For the recipe, please visit Tracey's Culinary Adventures. If your cupcake papers are a little smaller like mine are, you'll get about 20 cupcakes. The baking time remains the same, but check them for doneness at around 20 minutes instead of 25. I will never be sick of pumpkin recipes. Never! I love how you did the frosting. I wish I could get mine to look like that. Thanks! I used a star tip, and instead of piping in a circle from the outside in, I piped in a circle from the center out. Funny how reversing it produces such a different effect. I always love pumpkin recipes and I don't get tired of my pupmpkin spice latte, so no worries! These cupcakes look so yummy. The best part is that caramel frosting!!! Ohhhh I will allow myself to lick the top first (which I always tell my kids not to do it. Haha). Hahah, no way am I sick of pumpkin recipes, are you kidding me? This looks fantastic! Thanks! And I don't believe pumpkin season is over after Halloween. There's still Thanksgiving!